I just wanted to quickly let you all know about 2 opportunities you have to learn from me live in the coming week. First – the second in my 3-part series of talks at the Brisbane Square Library is on tonight a 6pm. It’s free to attend, but you need to call up and register! Tonight I’m speaking about the 3 pillars of marketing your handmade business online – what are they? Come along and find out. If you’re not in Brisbane (most of you reading this, I would assume) keep an eye on the blog, as I plan on writing about this in the next few weeks. Second – and this IS for EVERYONE, no matter where you are! 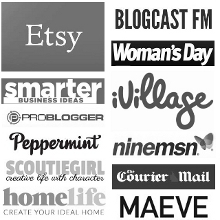 I’m speaking at the Problogger Training Event (aff) on the Gold Coast next weekend. Now, live tickets sold out ages ago, BUT there is a virtual ticket option – so wherever you are in the world, you can sign up to attend virtually and have access to ALL the talks and content. Apart from me, there are a whole raft of awesome speakers. You can see the schedule here. My talk is about blogging and social media for physical product-based businesses (that’s most of you, yes?). I’m going to be focussing on the huge advantage we have over service-based and e-product-based businesses when it comes to marketing our work online – specifically, the power of the image. I’ll also be revealing a few strategies I have developed – and that you can use – to ramp up your online marketing. Oh, and hey, if you just want to have a chat with me – come and say hi at the BrisStyle Eco Bazaar tomorrow from 9-3 at the Whale Mall in the Queensland Museum. Absolutely NOTHING to do with crafty business – I’ll be there selling a huge selection of my personal vintage dress collection. Have an awesome weekend, catch you on Monday.